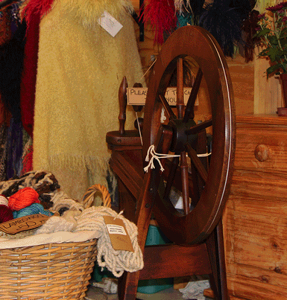 Spin Knits has been operating in the Watershed since 1992, initially specializing in hand spun and hand knitted garments. Visitors to our store can see our resident spinner, Florence Mantyi, spinning merino wool which we use to create one of our ranges. 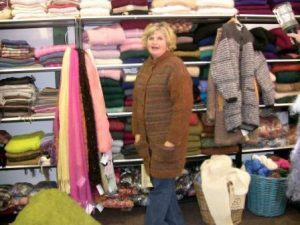 The success of our concept has resulted in the expansion of our original range to include not only hand knitted garments and yarn but also hand-woven items such as shawls.scarves, throws, hats, blankets, gloves, socks skirts, bags, and jackets. The materials used include all the natural yarns available to us, ie.wool, cotton, mohair, angora, alpaca, silk and ostrich feathers. Thus we offer an outlet for talented and creative (mainly) women who are unable to market their own goods, enabling them to continue producing and providing employment in their own communities. This is a very important part of poverty alleviation programs being initiated in rural workshops throughout South Africa. We also receive cotton and mohair items from a workshop situated high in the hills of The Kingdom of Swaziland. As all our items are individually produced we often include the name of the maker as well as the label of the workshop but this is not always possible as some of the items are worked on by several people. Also, it is not always possible to produce items in bulk as the nature of the items is so individual.